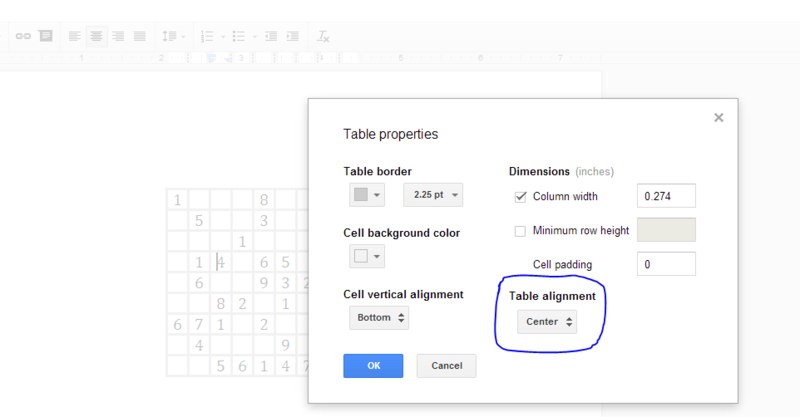 How to center a table in Google Docs? Centering data within a table cell or cells in Google Docs is straightforward and easy (i.e., highlight and center). How would I center an entire table? I'm honestly not sure when this was updated, but centering a table directly appears to be possible now. Simply right-click on the table and go to "Table Properties", "Table Alignment", "Center". Click OK. I just checked and currently it is not possible to do that, on the table itself. There's however a "hack" option available: add a table in a table, see screenshot. If you set the color of the grid lines to be white, than it will fade away. It will also give you flexibility to position the table off-center. Also pay attention to the comment made by @MaxMackie. Finally figured it out after spending a lot of time on the problem. Create a table that suits your needs. It will automatically default to the left side. Highlight the entire table by using the left mouse button. Then go up to alignment tab and hit center or left justification. Simply but hard to figure out. Another hack option which I do sometimes is take a screenshot of the table, paste it into paint, cut off the parts captured in the screenshot not belonging to the table, and then save it as a PNG. I then upload the PNG file to the google doc since it allows for the centering of images. Highlight the table you want to center. Press the button in-between left and right align. The center button has a long line, then a short line, then a long line, then a short line, then a long line, and finally, a short line. This is not possible in Google Docs at the moment. A nifty workaround (suggested by Google) is to create a table in your document with three columns. Space the side columns so that the centre column is large enough to contain the table which you wish to have in the centre of your document. Set the border width to 0 (in right click -> table properties) and then insert your table in the centre column of the larger, now invisible table. For right aligning, do the same as above but make the big table have only two columns, and then space the left column so that you have enough space in the right column to contain your table. How to transpose a table in a Google Document? How do you move to a right tab in a column of a table within a Google document? How do I lock table cells of a Google Docs document?